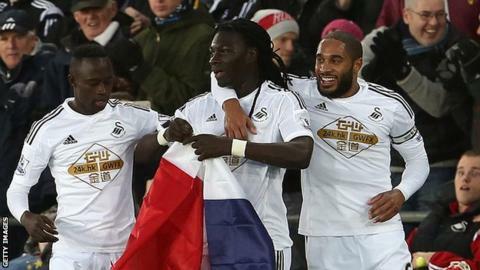 Swansea City striker Bafetimbi Gomis dedicated his side's goal in the 1-1 draw with West Ham to the victims of the Paris terror attacks. After Andy Carroll had given West Ham the lead, Mark Noble turned Gomis' header into his own net. French international Gomis then held his national flag in tribute to those killed during the shootings in France. "I wanted to join my country even though I don't live there anymore," he said. "It wasn't an easy week for all French people. "I am happy that Swansea supported me in this difficult time to provide me with the armband and the French flag to show my support towards my country." Despite Swansea's early pressure, they fell behind as Andy Carroll floated a precise shot into the top corner just before half-time. Gomis helped pull the Swans level with a quarter of an hour left. With top-scorer Wilfried Bony away with Ivory Coast at the Africa Cup of Nations and expected to join Manchester City afterwards, Gomis is eager to cement his place in Swansea's first team. "I am happy for my goal but I thought we deserved the victory," Gomis told Swansea's official club website. "We pushed hard and created a lot of chances and I thought we deserved to win. "Even though we had some players missing today, we created a lot of chances. "I have been working very hard and my team-mates have all helped me a lot."